A scattering at sea service is a private charter service on the 38 foot motor vessel, HyperFish. U.S. Coast Guard Certified for 26 passengers, the boat is also insured and Cremated Remains Disposal (CRD) Certified. The service time from departure to return to the dock is one and a half hours to two hours. If requested, additional time can be added at additional cost of $300.00 per hour. We ask that you board no later than twenty minutes before the departure time. Pricing: $580.00 for one Cremated Remain. Additional cremated remain can be add at additional cost of $150.00 per Cremated Remain. 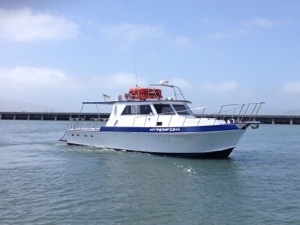 Our vessel is located at San Francisco Fishermen’s Wharf. Please reply back to confirm date and time of service. Please give us your Credit Card information to hold your boat or boats reserved. BEFORE 72 HOUR CANCELLATIONS ITS FREE OF CHARGE. CREDIT CARD surcharge is 5% of the total boat or boats charges.